Adobe has announced new standalone and Creative Cloud versions of its image management and Raw conversion software, Lightroom. The latest versions gain simple HDR and Panorama merging tools that create 16-bit DNG files from the merged results. Also added is the ability to paint-out regions of gradient filters, to allow more flexible overlays. Face Recognition tools have also been added, to simplify the tagging and retrieval of images. 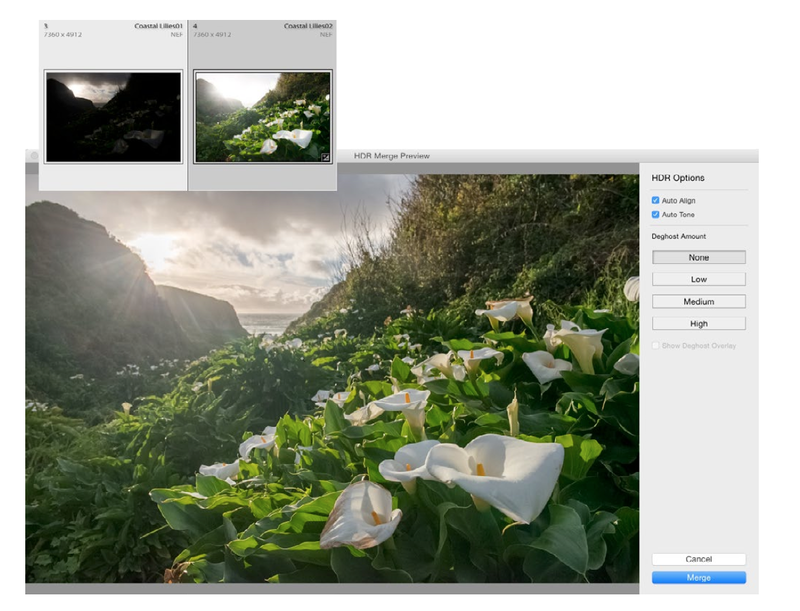 The CC version of the software is also designed to tie-in with the iOS and Android versions of Lightroom, by allowing for collections you choose to be synced and available across multiple devices, as well as on a web platform. The CC version also works with Voice and Slate: two new programs for creating image-based animations and presentations. The latest versions of the software make greater use of computers’ graphics processors, speeding up most processes and allowing complex tasks to run in the background without slowing the user experience. HDR Merge, which previously required a round-trip to Adobe Photoshop, is now natively supported in Lightroom. What’s more, the output is a 16-bit DNG file, which retains most of the flexibility of the original Raw. Previously, HDR merges and panorama creation would require round-tripping to Photoshop (or other 3rd party tools) and, even worse, would necessitate ‘flattening’ to a TIFF or PSD file, which locks in certain adjustments typically available to Raw files. New to Lightroom are these very HDR and Panorama merge options (which include the ability to create HDR Panoramas), each offering just a couple of options but promising to do all the complex exposure and white balance matching in the background. Importantly, the results are saved as new 16-bit DNGs, to maximize subsequent processing flexibility. In other words, the resulting DNG should retain most of the full editing capabilities each individual Raw file would’ve had before the HDR or panorama merge. The merging options and their ability to output essentially a Raw file is particularly interesting for post-processing applications we routinely engage in, and here we wish Adobe went a bit further and allowed for simple image averaging with Raw DNG output. Image averaging opens up a number of possibilities, including lowering noise in images, which can also help extend dynamic range. For example, an image that’s exposed for the highlights will typically have a lot of detail in the shadows, which are inherently noisy. Averaging a number of these images can clean up these shadows for further brightening, and avoids some of the local artifacts that can occur when merging drastically different exposures traditionally using HDR software. As far as we understand, though, simple image averaging isn’t supported, though you can get close in Photoshop’s HDR Merge by ensuring ‘remove ghosts’ is unchecked. 11 shots, 1/15s each, averaged in Photoshop to simulate a nearly 1s exposure. 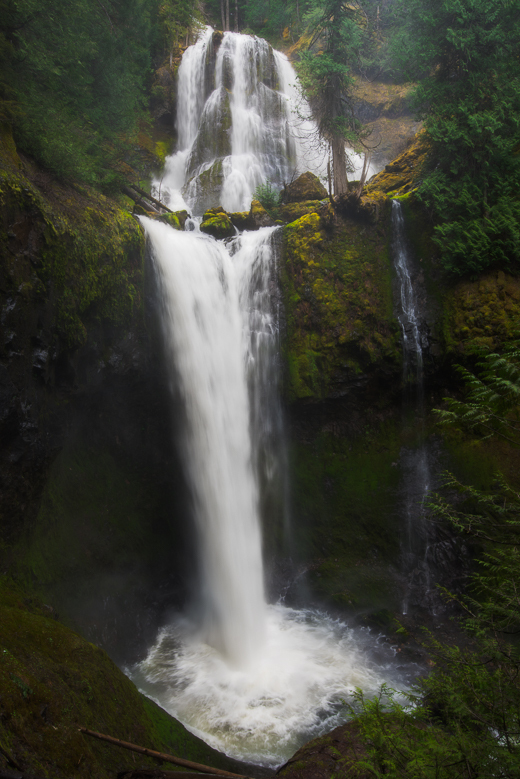 Falls Creek Falls in Carson, WA. Photo: Rishi Sanyal. One of the 1/15s shots that was averaged with 10 others to simulate a longer exposure. Photo: Rishi Sanyal. There’s yet another advantage to image averaging: it allows you to simulate the effects of neutral density filters. Many newer wide angle lenses don’t allow for the use of filters because of their large front elements. One way to simulate a longer exposure is to take a number of shorter exposures and average them together, as we have in the example above (roll-over the bottom right cell to see the original, shorter exposure). This requires a somewhat laborious layering process in Photoshop and, furthermore, requires ‘flattening’ of the file and therefore limited flexibility in further post-processing. A simple averaging feature with Raw output would be very much welcome, and though it’s possible that HDR Merge may sort-of enable this, we’d love to see direct support of it from Adobe. 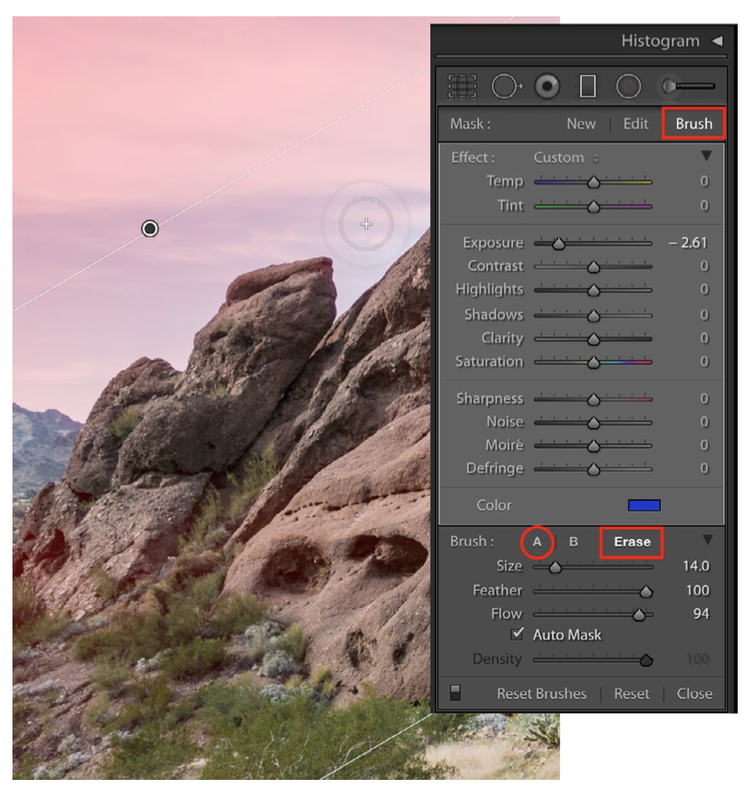 A new Filter Brush tool enables direct editing of gradient and radial filters. The Face Detection tool allows you to tag people in images, and will then attempt to identify those people in other photos. These identity tags can also be applied to images where the software hasn’t recognized a face. By default, identity tags are kept private, so that they aren’t exported with images. Other features include CMYK soft proofing for previewing offset print output, panning and zooming of photos in slideshows, more control over music in slideshows and the ability to correct red-eye in photos of pets. Lightroom CC comes included with all of Adobe’s Creative Cloud packages, including the $9.99 per month Photography plan. These all include Slate, a template-based app for building tablet-friendly parallax scrolling presentations of images from Lightroom, and Voice, an app to create animated presentations. Also included is integration with the latest Lightroom apps for iOS and Android devices. Adobe has confirmed that all the non-connected features will be included in a standalone software package called Lightroom 6, which will continue to be available as a perpetual license for $149. SAN JOSE, Calif. — April 21, 2015 — Adobe (Nasdaq:ADBE) today announced a major update to its Creative Cloud Photography plan with the release of an all-new Adobe Photoshop Lightroom CC that delivers lightning-fast performance and new tools to edit, enhance, organize and showcase beautiful photos. With Lightroom CC and the legendary magic of Photoshop CC, Adobe Creative Cloud Photography empowers photographers to transform photos into amazing shots. Creative Cloud Photography also includes unique sophisticated mobile capabilities: automatically syncing photos with Lightroom CC on the desktop, Lightroom on mobile devices lets users access and edit their entire catalog of photos on iPad, iPhone as well as Android smartphones and tablets. At just $USD9.99 per month, Adobe’s photography plan champions photographers of every level — bringing the tools relied on by photo pros worldwide within reach of anyone who loves photography. Photoshop and Lightroom have been fundamental in the evolution of digital photography. Today, Creative Cloud Photography is leading the transition from a traditional desktop-based process to a more mobile, connected workflow for digital images. Anchored by a major update to Lightroom CC, Creative Cloud Photography is the must-have solution, offering powerful editing and photo organization across multiple devices, all powered by Adobe’s industry-defining imaging technologies. Facial Recognition – Quickly find and categorize images of family and friends. For anyone who loves photography, it’s essential they can organize, edit, and share photos from mobile devices. Automatically synced with Lightroom CC on the desktop, Lightroom on mobile devices lets users access and edit their catalog of photos across a full range of iOS and Android devices. This release includes a major enhancement for Android with DNG raw file support on compatible Lollipop-enabled devices, providing customers the full power of raw file post-processing on their Android smartphones and tablets. In addition to Lightroom CC, Creative Cloud Photography plan includes Photoshop CC, the imaging software that continues to redefine creativity in the digital age. Celebrating its 25th birthday this year Photoshop’s legendary magic touches virtually all the inspirational imagery that surrounds us. Now, thanks to Creative Cloud Photography, photographers have a powerful round-trip editing workflow from Lightroom to Photoshop CC. Even cut out and combine photos on your iPhone and iPad with Photoshop Mix, connect to Creative Cloud, then refine your work in Photoshop CC. In addition to sharing instantly with social networks such as Facebook, Flickr and Instagram, new to Lightroom is the ability to create beautiful, polished video slideshows using still images, video, and music, featuring professional effects like pan and zoom. After using Creative Cloud Photography to produce stunning images, anyone can craft amazing stories that place photos at the center of the narrative, using two groundbreaking storytelling apps from Adobe: Slate and Voice. Adobe Creative Cloud has approximately 4 million paid memberships worldwide and all Photography and complete plan members are able to access the new version of Lightroom CC today – at no extra charge – showing, once again, the incredible ongoing value of Creative Cloud. Creative Cloud features the world’s leading creative desktop apps; a growing family of mobile apps that are seamlessly integrate with the desktop apps and creative assets; expert training; and access to a dynamic creative community, where creatives can discover inspiration and opportunity. A free 30-day trial version of Lightroom CC is also available. Creative Cloud Photography plan is designed to make onboarding easy whether you’re a beginner or pro, or have previously used Photoshop, Lightroom, Photoshop Elements or Apple Aperture. Available now is an easy-to-learn library of photography tutorials aimed at all levels. Adobe Creative Cloud Photography plan (USD$9.99 per month) includes Lightroom CC across desktop, web and mobile, Photoshop CC and Photoshop Mix (for iPhone and iPad). All products are also available as part of Creative Cloud complete plan. Information on Adobe Creative Cloud pricing and plans can be found at: https://creative.adobe.com/plans. For more detailed information about Lightroom CC product features, upgrade policies, pricing and language versions, please visit: www.adobe.com/go/lightroom.